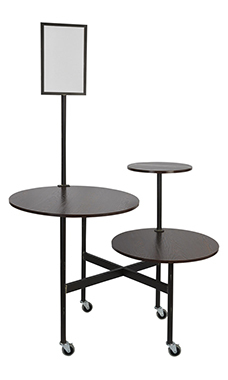 The Boutique Vintage Round 3-Tier Dark Walnut Table with Sign Holder stands 74½"H overall and is made of melamine. 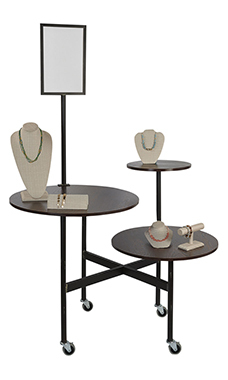 The top table measures 16" Diameter x 41"H, the middle table measures 30" Diameter x 34½"H, and the bottom table measures 25" Diameter x 24¼"H. This table features a built in sign holder that holds 11" x 16¾" signs. However, this table includes one blank chalkboard & one dry erase board sign. Casters are also included. Assembly required.